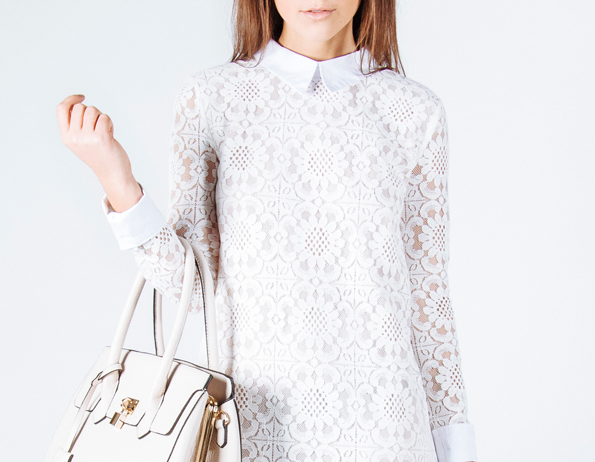 spring style – Girl Who Would be KING on Life, Style and INSPIRATION. Thoughtfully choosing versatile, well-made pieces is the key to building a timeless closet. These photos and main descriptions are taken from Rachel Zoe’s Website. I find everything to be thoughtfully curated. Pieces to mix and match with what you already have. To order see below. Classic items like the leather clutch is an exclusive size available to Box of Style members. Just big enough to hold every day essentials like a wallet, keys, cell phone and lipstick (that’s an essential right?). I stow it inside a larger bag and simply take it out to use alone when need be like going out for dinner. A versatile hue, like the black of this clutch, pairs perfectly with all manner of ensembles. Another essential is a silk scarf. Even though I own a numerous amount of silk scarves you can’t really have too many. Right?? Plus they’re so easy to store and tie in a multitude of ways. The Chan Luu silk scarf shown is available in 2 exclusive Rachel Zoe Collection prints: cactus flower or leopard. It was a toss up but I went with the leopard. This coming from the woman who wears scarves meant for her dogs (I know; it’s a problem). These dainty gold bangles offer a simple elegance on their own or can be worn with other pieces and mixed with other metals for a more dramatic effect. The open design allows for easy adjustment. A little bit of added bling never hurts. The all natural ingredients in this eye cream make it safe enough to eat, but you won’t want to waste it once you start incorporating it into your regimen. The coffee and cucumber extract work to reduce puffiness and inflammation while the gold leaf improves circulation and radiance. My full review will come later but so far, so good. Skin Gym Gua Sha…..are you ready? You heard it here first, gua shas are the new jade rollers. This rose quartz massage tool helps to drain toxins from the face by increasing circulation and decreasing puffiness. Great for long flights and mid-day pick me ups but with regular use as a part of your daily regime, you’ll see the best results. Long before they became our new favorite beauty tool, Gua Shas were an integral part of traditional Chinese medicine for thousands of years, used for tissue and muscle massage for the entire body. Gua Sha literally means ‘to scrape’ in Chinese, and this (gentle!) scraping motion helps to increase circulation, decrease the appearance of wrinkles, boost collagen production and encourage lymphatic drainage. For many of us this sounds great, but we’re not clear on exactly how to reap all of these benefits. Start by applying a face oil to clean skin, then read on for the top motions to master to get the most from your Skin Gym Gua Sha from the Spring Box of Style.If you’re a visual learner, find a handy video tutorial by acupuncturist and holistic medicine practitioner Debbie Kim. For more Gua Sha tips, visit Skin Gym’s site. I always look forward to Spring Break! accessorize, accessorize….so why not an accessory for an accessory? But to me Spring Break means a good excuse to let loose with the wardrobe. Exchange bulkiness for something reflecting the warmer (hopefully) temperature. More color and lightness. Accessories are playful and important. Speaking of, there’s no accessory more versatile than a lightweight scarf. Especially one that is sustainable, versatile and lightweight. 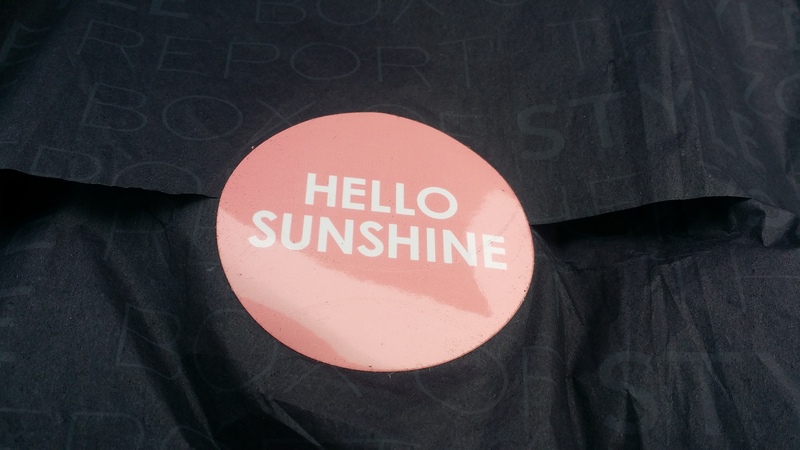 The Symbology Scarf received in my Rachel Zoe Spring Box of Style is both pretty and purposeful. This exclusive collaboration is also feel-good Fair Trade Fashion. The bright, screen-printed iteration of sustainable fashion label Symbology is so much more than a pretty add-on. Boasting a chic peacock-feather print and a gold-berry colorway that pays homage to Indian bridal saris, the creation of this warm-weather staple also empowered women artisans from start to finish. Founder Marissa Heyl was inspired to start Symbology while on a research trip to India to assess how fair trade empowers craftswomen. She met artisans in remote villages and sprawling slums. She was inspired by their resilience and incredible talent in a myriad of art forms. Watching Gita, a young mother of three, block-print a beautiful tablecloth, Marissa envisioned it as a dress. It was her aha moment—combining her lifelong passion for fashion design with women’s rights. The Zoe Report x Symbology scarf was handcrafted by ten women in the desert region of the Indian Village of Sanganer, where bright sun and dry heat create the ideal conditions for printing. In this region virtually all printing is ordinarily done by men but these women were trained specifically to create this scarf for those who ordered the Spring 2017 box of style. The peacock feather design symbolizes integrity and beauty, while the deep berry and gold hues emulate Indian bridal saris. Armed with their new skill set, these women have far greater access to design opportunities and sustained income in the future. Which makes me feel even better wearing it. Thank you! Acclaimed former interior and graphic designer Eileen Fisher launched her self-named collection in 1984 making her mark with clean lines, simple shapes, and a timeless, functional style. And she designs clothes with a conscious. What does that mean? Just as farm-to-table is changing the way we think about our food and where it comes from, farm-to-closet will change the way we think about clothing. Because clothes are an agricultural act. An odd way to think about garments maybe, but true when they’re made of natural fibers. 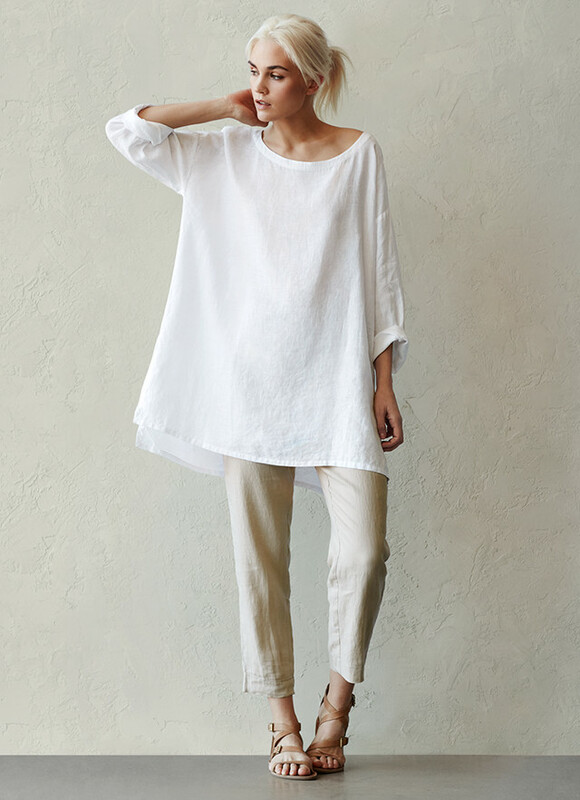 I love wearing my Eileen Fisher silk shells but this season her key ingredient is organic linen. The company uses flax grown by farmers who rely on age-old practices and modern insights to control weeds and pests naturally. It’s harder than spraying a field with synthetic chemicals, but worth the effort. By supporting organic farming, you’re helping to protect the soil that sustains what we eat – and what we wear. So you can feel even better about what you’re wearing. A great meal is only as good as its ingredients, and a great look is only as good as the materials it’s made from. 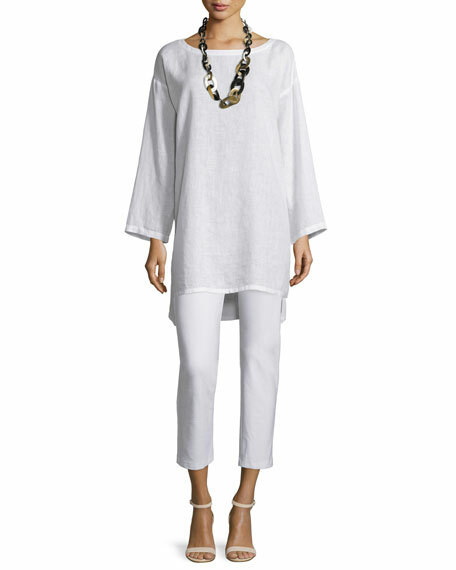 Eileen Fisher tunic in lightweight, breathable handkerchief linen. 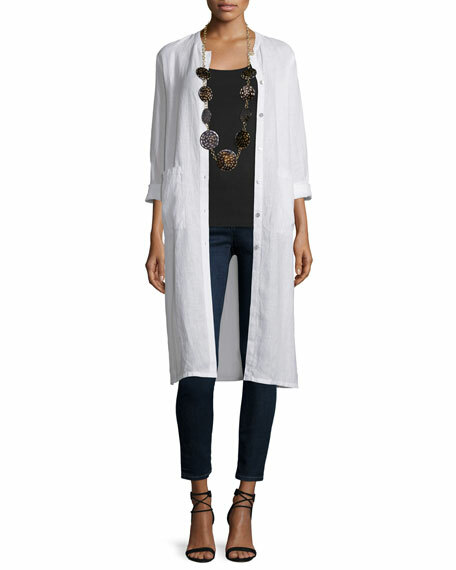 Eileen Fisher organic handkerchief linen jacket—available in your choice of color. Mini mandarin collar; button front. Their vision: for an industry where human rights and sustainability are not the effect of a particular initiative, but the cause of a business well run. Where social and environmental injustices are not unfortunate outcomes, but reasons to do things differently. Everyone knows I love a surprise just as much as the next gal. Not a scary surprise like someone jumping at you from out of nowhere and gives you a mild heart attack – just a fun pleasant kind of surprise. 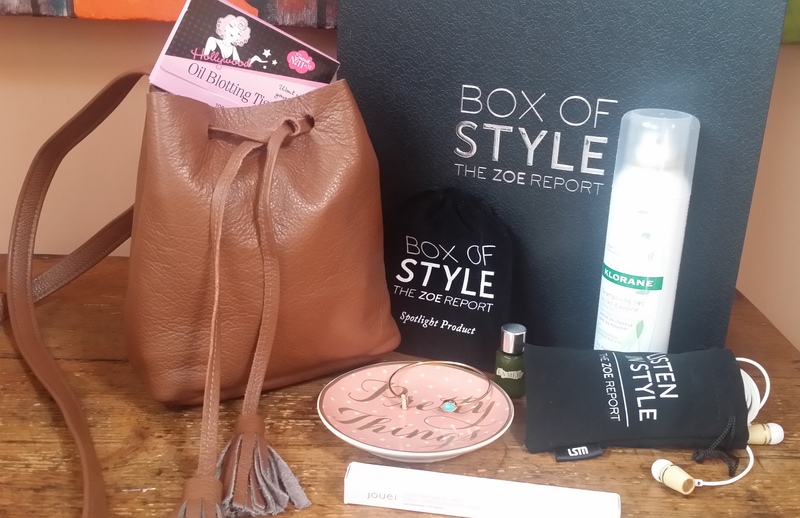 So you can imagine how happy I was to receive a…………..
Mystery girly Gift Box to celebrate Spring from the people over at the Zoe Report. 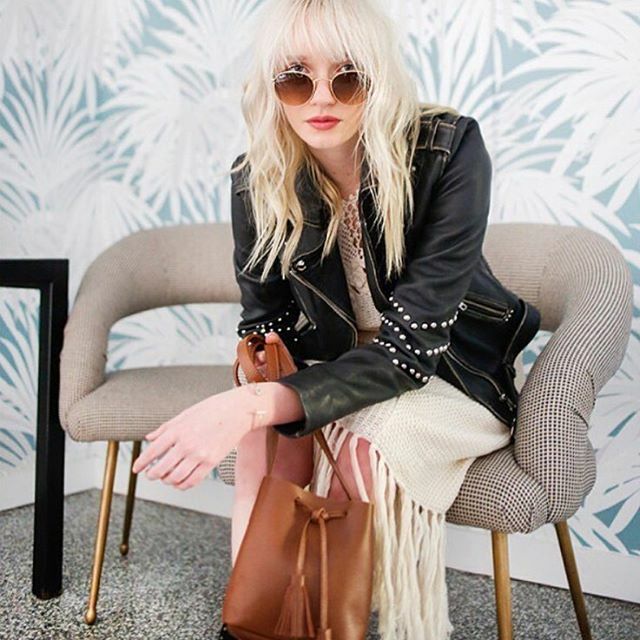 The Zoe Report (if you don’t already know) is an online style destination curated by none other than designer, celebrity stylist, editor and all-around business woman extraordinaire, Rachel Zoe. Of course I’m going to share with you all the goodies inside the beautifully wrapped box that everything came in. Even the tissue paper (above) is stylish. So adorably cute! First I should tell you that anyone can order (up to a limited amount as they sell out) the set (s) online although the Spring Box of Style (shown above) is now sold out. The boxes will cost anywhere from $100USD for a one-time only gift box or $350USD for an annual set for each season (that’s 4 boxes). What you get inside is worth more than what you would pay for everything retail. Everything is chic and useful and the retail value of the contents are revealed as prices and links to websites are provided. The box I received was valued at $344 USD (before taxes) not including a deluxe size sample of La Mer Skin Concentrate (I’ll review this later on the beauty post). You can also get additional discounts (anywhere from 15 to 30%) off further orders on most items for a limited time should you desire. “The Sidekick” Leather Bucket Bag designed and made in L.A. Gorgeous custom go-with-anything caramel leather with suede lining. The best thing is that it’s super light, just big enough to carry all essentials and I love that I can wear it cross-body (especially good for dog walking). 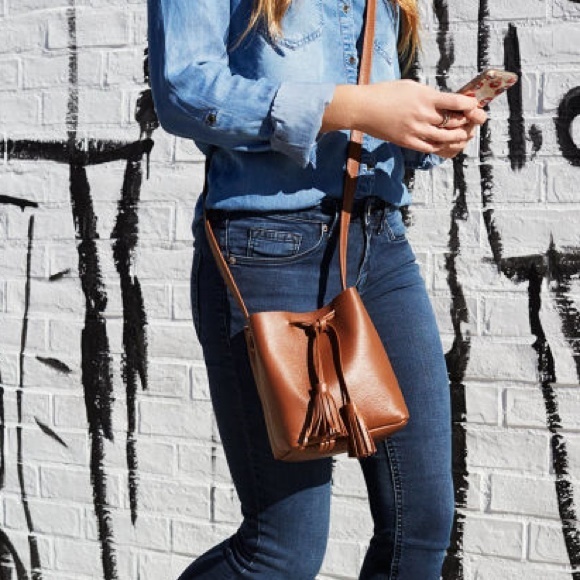 Cross body is my latest obsession. I know I’ll get so much wear out of this simple bag all Spring/Summer long. Jouer Crème Eyeshadow Crayon – sultry with a little shimmer, perfect for evening. Delicate Pave and Stone Cuff gold plated bracelet by Jules Smith – chic enough to stand on its own or layer with other jewelry. In other words, simply perfect. Chic pair of great sound headphones by LSTN Sound Co – Wembley Earbuds. 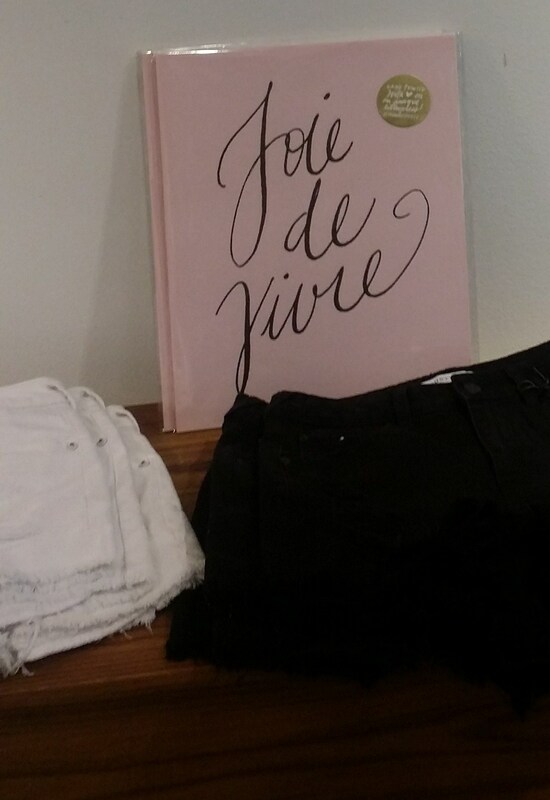 A hair saviour dry shampoo by Klorane – discovered by RZ in Paris during fashion week. The one she recommends as “the one.” Who am I to argue? Something to blot that midday all day shine with – Hollywood oil blotting tissues for a photo-ready look. 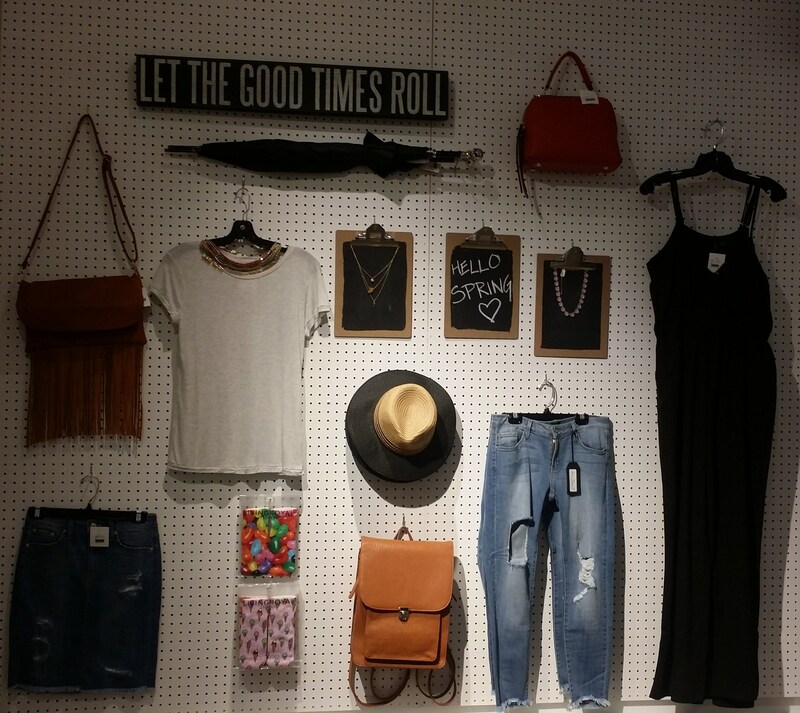 Spring Fashion is popping up all over SCOOP, Vancouver’s favourite pop-up shop. So what could be better than perusing the aisles while listening to music played by a deejay with a glass of bubbly in hand? 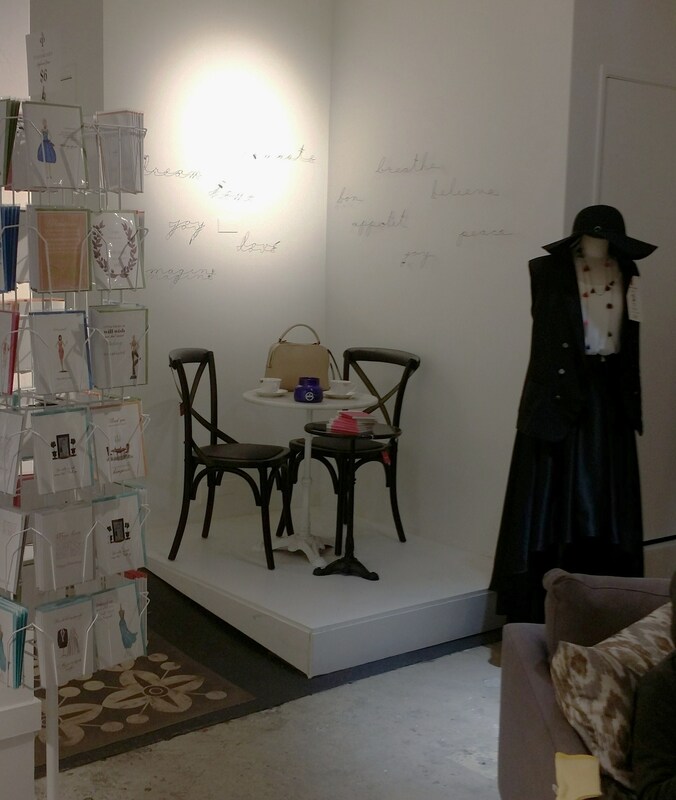 That’s what happened when I attended their blogger evening last week at the South Granville Location. What used to be a rather small operation for up to six weeks at a time has turned out to be two store locations for all seasons. At present, Scoop is open for 6-8 weeks at certain times of the year. Those times being Spring/Summer and November/December. Owner Deb Nichol strives to keep each of the Scoop locations fresh and exciting by creating a bit of a buzz surrounding the night before each opening so it’s always a surprise. The thing about Scoop is that there’s so much turnover of merchandise that each time you set foot inside you find something different. 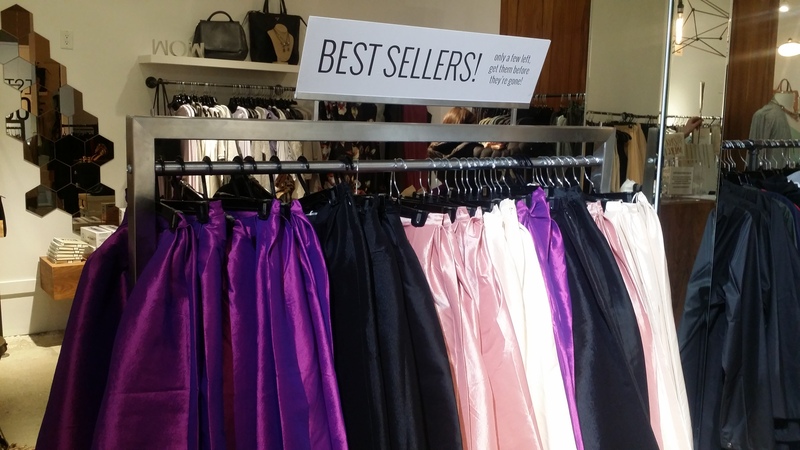 They source merchandise and get inspiration by traveling to places like New York, LA, Vegas, Atlanta and Toronto. Besides clothing, they offer jewellery, cards, candles and wall hangings. If you don’t scoop up something fast you may never see it again. Then again, I did come across a pair of linen pants I once purchased that they brought back the following year. Must have been a popular item. Normally I don’t want to see something repeated, but in this case I wanted another pair anyway so it was a good thing. The Latest Scoop on S. Granville – 2928 Granville St. The Latest Scoop in West Vancouver – 2470 Marine Dr.